Perhaps it sounds a little too cliche to describe certain women as “beauty with brains”, but when you find a woman like Faith Jenkins who has won world-class beauty pageants and graduated top of her law class then its safe to say you have a special lady on your hands. Faith Jenkins is definitely the perfect amalgamation of elegance, poise and a sound intellect. Faith was born on 25th November 1977 in Shreveport, Louisiana and attended C. E. Byrd High School in Shreveport. Upon graduation from High School, Faith proceeded to the Louisiana Tech University, where she earned a Bachelor’s degree in Political Science. After her first degree, Faith’s journey into pageantry began when she contested and won the Miss Louisiana Tech crown. She became the first African-American woman to win the University crown. Buoyed by her triumph, she contested and won the Miss Louisiana crown in 2000 and became the first African-American woman to win. Her win at the State granted her a ticket to represent Louisiana at the Miss America beauty pageant the following year. 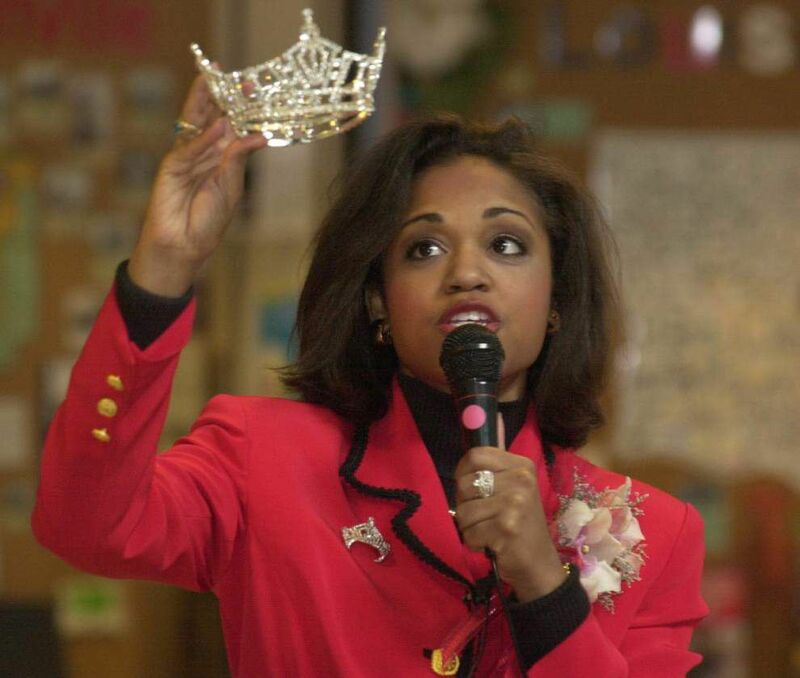 At the Miss America 2001, competition Faith Jenkins emerged the first runner-up. She holds the record as the only contestant in the history of the Miss America Pageant to be awarded all three of the following awards: swimsuit, talent, and the “Quality of Life” national community service award for her volunteer work. Now firmly in National consciousness, Faith seized the platform to address issues dear to her heart. She travelled extensively during her reign, engaging student organizations, business executives, captains of industry, political pressure groups in a bid to draw attention to the plight of the younger generation. As a national figure and role model, Faith was a frequent visitor to prisons and juvenile centers, encouraging inmates with her personal story of determination and focus. Her trips and engagements as a beauty queen helped her develop a passion for advocacy – one she would later express better via the legal profession. Intent on pursuing her dream of becoming a Lawyer, she enrolled at the Southern University Law Center in Baton Rouge, Louisiana, where she earned her Juris Doctorate. On May 29, 2014, it was announced that Faith Jenkins will be hosting her own nationally syndicated, arbitration based court show. The Show was earmarked to debut on September 22nd, 2014. The Judge Faith Show is co-produced by Hank Cohen and Katty Sapp and directed by James Ditchfield. It is still a bit interesting how a media personality constantly exposed to the limelight can shield herself from intrusive publicity. All through her time as a beauty queen and as a litigator, not a word of Faith’s personal life has surfaced in the media. No record of her immediate family or her childhood. Faith Jenkins is not married. There has been no record of her being in any relationship. No scandals, no negative publicity. She has managed to maintain a squeaky clean public profile. One of the advantages of being versatile is that your income channels are more fluid and flexible. Upon graduation, Faith delved into the cut-throat jungle of law practice. She worked on Wall Street with Sidley Austin as a litigator. In her time as a corporate litigator, she represented big-name clients in class action securities fraud lawsuits, breach of contract disputes, regulatory investigations, and other commercial matters. After five years, in a bid to feel both divides of the legal practice, she joined the Manhattan District Attorney’s office as a New York City prosecutor. The largest chunk of her earnings comes from her TV appearances. She receives quite a handsome pay as a legal analyst for the cable news channel MSNBC. She has appeared on other channels including CNN, Fox News Channel. Faith has made appearances on shows like Fox & Friends, The O’Reilly Factor, Hannity, and Political Nation with Rev. Al Sharpton. She has also had earnings from her brief stint in modeling and beauty pageantry. Faith Jenkins is currently worth an estimated $2 million. Faith Jenkins boasts of an impressive hourglass physique. Though not the tallest at 5 feet 3 inches, her vital statistics read 34-26-34. The beautiful bombshell weighs 55kg and wears a dress size 8.